I've really been getting in to planting things lately with Harry. We've planted lots of vegetables and flowers, but they take a long time to grow so I thought that it was time to try some cress. 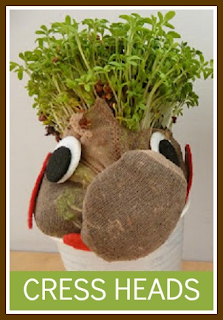 I found these lovely cress heads on Pinterest so I thought we'd give them a go for this month's Pinterest Challenge, which this month is being hosted by Sew Scrumptious. You can find the pin here on my Pinterest board, and here is the original picture and instructions. They start growing almost straightaway, so are great for pretty much instant gratification. I'm not too keen on actually eating the cress though, but the seeds were cheap! Thank you! I never know what to serve cress with, I tend to have cheese and marmite sandwiches and it doesn't really go. Also this stuff has quite a strong taste to it. I'll pop it in the freezer and bring it up to you! What a great idea, they grow super quick then! We don't have a garden so might have to try this one to put on the window sill. I actually like cress too! They start growing almost immediately, almost the same day if you do it in the morning! You can also grow it in just about anything, so you can make all sorts of grass creatures. I saw a cool cress caterpillar somewhere made from egg box segments.